I argue that the main causes of increased consumption in Britain until 1750 was the acquisition of Barbados and Jamaica as colonies, the main causes of increase from 1750 – 1850 to 1850 were the introduction of tea to the British diet, and the main causes of increase from 1850 to the present are the growth of capitalism. For Britain, the first cause of increased consumption was the acquisition of Barbados and Jamaica as colonies in the seventeenth century (Mintz, 37). These colonies utilized slave labor on their sugar plantations. This permitted a massively increasing amount of sugar to be imported into Britain, exposing more of the population to its taste. Below we see an illustration of the interior of a nineteenth-century sugar boiling-house by R.Bridgens, depicting the mass production of sugar to be shipped to Europe from the Carribean production facilities. These were essential in the first large increase and change in sugar consumption. Before the supply of sugar for Britain increased, sugar was a kingly luxury. In fact, Mintz suggests it had a “symbolic force” (Mintz, 90). The extremely wealthy would use sugar as decoration. For instance, extravagant feasts would be held in which elaborate sculptures utilizing sugar of animals, buildings, and other striking things would be on display and eaten (Mintz, 89). These displays would confirm the social standing of the individual providing the meal. Those who would eat these attractions would validate the power and social position of the host (Mintz, 90). The “symbolic force” lies in the way sugar was a symbol of status and power in itself. As sugar became more readily available due to slave plantations producing it, the symbolic force of sugar decreased and its economic importance grew. That is, as production capabilities increased, sugar became a tool for individuals to gain power through making money through sugar production. In Britain, it was no longer only the most powerful who could obtain sugar. The common people could purchase and consume it. This meant that the consumption of sugar by the powerful in itself mattered less (Mintz, 45). As Mintz puts it, “sugar was transformed from a “luxury of kings into the kingly luxury of commoners” (Mintz, 96). Even, though sugar was transformed in this essential way, it was still used in the manners it had been before, such as decoration. Below are nineteenth century illustrations of desserts by French baker Dubois, revealing the fact that sugar maintained its use as decoration, even though its symbolic force faded. By 1750, sugar was a common luxury, and as such acquired an “everydayness.” Sugar consumption continued to increase from 1750 to 1850 due to the introduction of tea, and other similar beverages, into the British diet. Tea was first introduced into the British diet toward the end of the seventeenth century (Mintz, 108). Tea followed the same track as sugar: first being consumed by only the wealthy, and then becoming a common beverage. As it became popularized, sugar became even more common. This is because sugar was used to sweeten tea. For both goods, a “ritualization” (Mintz, 122) occurred in which the commodities gained an everyday quality. Thus over the course of the century following 1750, sugar, through the introduction of tea, became increasingly desired and consumed. The final cause of increasing sugar consumption was the growth of capitalism. As capitalism grew, the wage labor force in Britain grew. As the working class grew, more people were seeking low cost food substitutes that provided energy (Mintz, 148). The division of labor led to more and more factories with individuals pursuing individual functions. Laborers who were working in factories now purchased sugary foods to sustain their energy and increase their productivity. Sugar increased energy and productivity and thus “figured importantly into the balancing accounts of capitalism” (Mintz, 148). Further, sugar appeared in more and more foods, such as bread and other staples of the laboring class’ diet. Thus, the intake of sugar increased due to the increased use of sugar in a variety of foods that the laboring class needed to maintain efficiency, a need caused by the driving force of capitalism. That is, sugar took up more of a caloric percentage of individuals’ diets from 1850 onward than from 1750-1850 due to capitalistic forces. 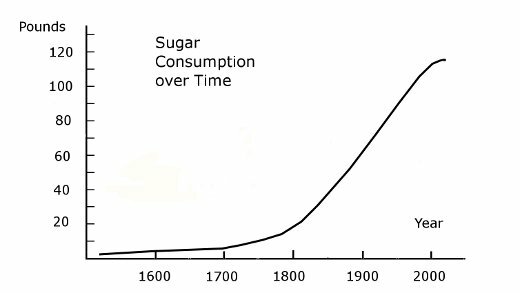 Clark Ross argues that this is the correct interpretation of what caused the sugar consumption in Britain over time (Ross, 105). He suggests sugars role was complementary to the much more powerful forces already in play. 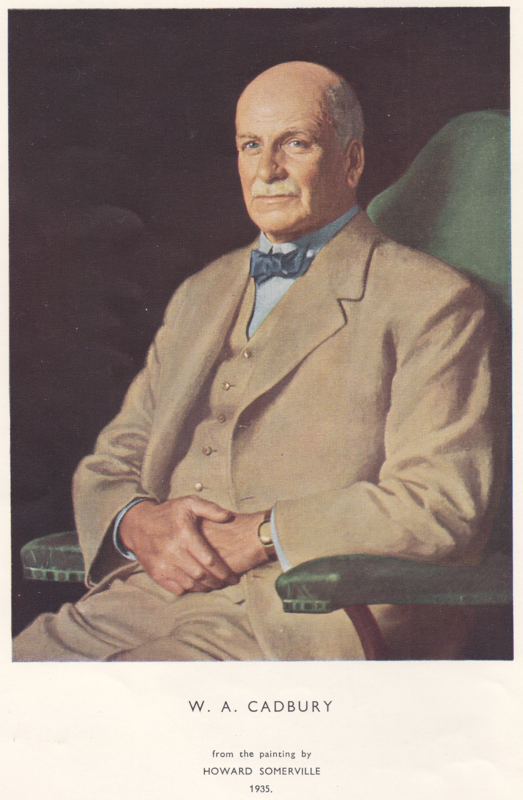 I argue, however, that the sugary diet that was at play in Great Britain permitted the laboring class to increase efficiency in a manner that would not have been possible without such a diet. Indeed, the same capitalistic forces may have driven society overtime, but the diet of sugar spurred those forces to take affect more rapidly, and in doing so, affect the sugar consumption itself. In the modern day, the rapid increase in sugar consumption has slowed. This can be attributed to the current health risks associated with sugar intake, such as the development of diabetes and obesity. There are “junk food taxes” in place on foods that have a very high level of sugar so as to limit these risks in the population (Sampeck 2016). Thus, the increase in sugar consumption in Britain over time was a result of the transformation of sugar from a kingly luxury to an everyday commodity. This transformation occurred first due to the acquisition of Caribbean colonies, then by the introduction of tea into the British diet, and finally by capitalistic forces. Ross, Clark G. Ethnohistory, vol. 34, no. 1, 1987, pp. 103–105. Mintz, Sidney W. Sweetness and Power: The Place of Sugar in Modern History. New York, N.Y: Viking, 1985. Martin, Carla D and Sampeck, Kathryn E. The Bitter and Sweet of Chocoalte in Europe. 2016. Although Slavery has long been abolished, the chocolate industry has been utilizing coerced labor and slavery, knowingly or unknowingly, to this day. The most essential ingredient of chocolate, cocoa, must be mass produced for major corporations that produce a majority of the world’s chocolate. This entails extensive manpower, which was once provided by slaves before the abolishment of slavery. The chocolate industry chose to turn a blind eye to a form of modern slavery in the case of the Cadbury company in Sao Tome, a Portugal controlled area off the Coast of Africa in the early 1900s. Cadbury, one of the biggest chocolate companies in the world today, directly bought cocoa from plantations who used slave labor, and did not immediately condemn it, thereby indirectly supporting post abolition slave labor. Interested in the claims of slavery in the West African Portuguese colonies, William Cadbury himself sent a young man by the name of Joseph Burtt to investigate what was going on. Burtt was a devout Quaker, and held deep Quaker values. Burtt returned back to Cadbury after his two year trip with similar results to that of Nevinson. (Satre 13) He found that slave labor had in fact been in use on the islands. He submitted a report to Cadbury, but they took a long time to reach the public eye for a number of reasons. The foreign office of Great Britain was keen on not offending the Portuguese government, so they requested certain aspects of the report be deleted. (Flewelling) The report was also to be adopted by other players in the chocolate game because they were all buying from these islands as well. (Flewelling) This lead to long negotiations as to what the final report would contain and was ultimately another delay to the process. The Cadbury brothers depended too much on cocoa from these regions to be able to boycott them until they found another source of cocoa that did not use slave labor, and they did just that in 1909. (Flewelling) After Cadbury took a trip himself to Sao Tome and the surrounding islands, he realized that the reports were in fact true, and that the Portuguese government really could not enforce abolition in these areas. (Higgs 148) They chose the Gold Coast as it had better quality cocoa than the Portuguese slave labor areas. All of this combined to allow the Cadbury company along with other chocolate producers in Great Britain to announce their boycott of the Portuguese held cocoa producing islands that were employing slave labor. This is one of the first, but sadly not the last, well documented and notable incidents where companies use the morally reprehensible tactic of post abolition slave labor to make profits margins rise and costs lower. William Cadbury knew of the transgressions in the Portugal controlled West African province cocoa plantations, yet he waited until it was convenient for his company to come out and condemn the labor situation in the affected areas. He found another way to get high quality cocoa beans for just as cheap, and then he stopped buying from the well documented slave laborers. Politics and fear of offending the Portuguese government also got in the way of doing what is morally correct and having the type of integrity that a giant corporation should have because of the type of power and influence they wield. Cadbury objectively participated in illegal and disgusting schemes with the incentive of higher profits and convenience. This type of action to farm cocoa still goes on today, but it often has deeper layers and complexities that must be dove into to truly understand. Child labor and quasi slave labor in the eyes of the global community is considered wrong in America and among many other countries, but for some, it is ingrained in their culture. Is this still slavery or is it just a part of a culture that has yet to prescribe to the modern ideals of labor ethics? You be the judge. Martin, Carla D. Slavery, Abolition, and Forced Labor . “William Cadbury, Chocolate, and Slavery in Portuguese West Africa.” Isles Abroad, 11 Feb. 2017, britishandirishhistory.wordpress.com/2016/05/11/william-cadbury-chocolate-and-slavery-in-portuguese-west-africa/.Flewelling, Lindsey. BreakingNews56. “Chocolate Child Slaves- CNN.” YouTube, YouTube, 16 Jan. 2012, http://www.youtube.com/watch?v=eHDxy04QPqM.